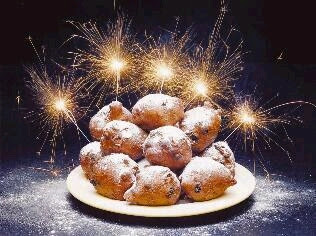 Good resolutions, firework, lots and lots of oliebollen and a chance for 20 million in the new years eve lottery. As I already let you know with my ‘Things to Eat before You Die’-list, oliebollen are one of my favourite things in the world. But, needless to say, only oliebollen from my family recipe. The average bol that is sold during this time of year in the special pastry stalls is a bit too greasy for my taste and has nothing, or maybe, when you’re lucky, 4 raisins as filling. Not really my taste. We like our bollen as they were made intentionally: properly filled. The trick is to use eggs, lemon zest ànd juice and lots and lots (and lots) of apples, raisins and currants. A delicious, sweet, airy and moist bol with a golden brown, crispy layer will be the result. "Let's hope it's a good one, without any fears." Up to new starts, hopes, wishes, opportunities and chances. 1. In a small saucepan, heat about 0,2L (1 cup) of the total 0.6L until it’s tepid. (about 40°C - 104°F) Pour the warm milk in a small bowl and crumble the yeast over it. Stir gradually until it’s completely dissolved, cover up and set to rest on a warm place. 2. Peel the apples, chop them in 4 pieces, remove the core, and cut the parts into tiny little pieces. Put the apples together with the raisins, currants, lemon juice and lemon zest in a large bowl and mix well. 3. In the biggest basin you have, (or a clean bucket) sift together the flour and salt. Make a small hole in the centre and insert one egg. Mix with the electric mixer fitted with the dough hooks until the egg is completely inserted. Then add the second egg and repeat this process until all eggs are added. In a small pan, melt the butter. Heat in the ‘milk’ pan the rest of the milk until tepid. 4. Heat the deep-frying fat until it reaches 180ºC. take an ice scooper or two tablespoons and stick the spoons in the heated fat for a couple of seconds. (this will prevent the batter from sticking to the spoons) take a big spoon full of dough, round it a bit, and carefully dip it into the oil. Repeat this, but don't have more than 6 of them into the oil at the same time (this also depends on the size of your pan). Fry the 'oliebollen' for 6 minutes, 3 for each side, until they are nice gold brownish. 5. Take the oliebollen out and let them leak out on kitchen paper until they are completely dry. Serve warm or cold with lots and lots of powder sugar. The oliebollen will keep for 2,3 days, but they are best the first day. Keep them in a bowl covered with a towel. [Sigh] The presents are unwrapped, the family is gone, the Christmas tree has lost most of it’s special-ness, and you’re probably still full from all the loads of food. Finally, everything is becoming calmer. Now starts a bit of that peacefulness. You survived the big stress and it’s now time to relax… How about some more cookies? Just kidding. The true Christmas thought isn’t of course about presents or mountains of food, but it is a nice side issue. It’s far from necessary, but it is a great opportunity to do something extra for your loved ones, pamper them (a bit) with treats you know they would appreciate. But it’s clear that these amazing books come with another problem. In gods name, what should I make first?? 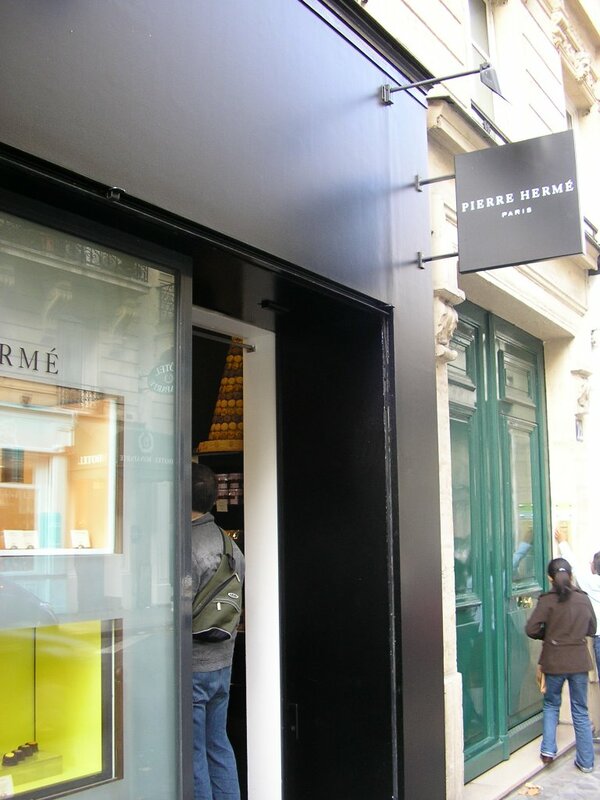 It’s already impossible to choose from Hermé’s, how should I ever pick something out of three?? Back to other sugar, back to the Christmas Sugar Cookies! 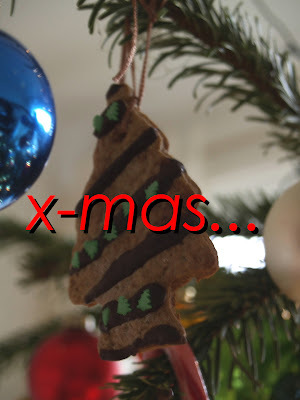 Although Christmas is over and I do think these are really Christmas-y cookies, I wrote down the recipe here below. They are so sweet, buttery and easy that I wouldn’t mind having them, lets say, on a February morning. And you can make them of course easily less Christmas-y by replacing the cherries for something like chocolate chips! They make a nice present, and they are perfect for making ahead, as you make the dough in advance. The Plaisir Sucres, Macarons, Croissants, Tarte Tatin, and who knows what more, (unfortunately) have to wait a bit more because first…it’s (almost) time for making the best oliebollen! 1. In a large bowl, beat the sugar and butter together until pale and creamy. Gradually beat in the eggs, vanilla and milk. In a new bowl, mix the flour, baking powder and salt together. Then add a few spoonfuls at a time to the butter mixture, stirring with each addition to combine. Fold the cherries through the dough, and shape into to logs. Wrap the logs in cling film, freeze one and chill the other for at least 2 hour. Take the chilled logs from the refrigerator, unwrap, let warm up slightly, and use a large knife to slice rounds the thickness of a coin. Lay the cookies out on the trays and bake for about 5 minutes until golden brown. Repeat this process for the other log in the freezer. Cool on a wire rack before serving. The cookies will keep in an airtight container for up to 3 days. Optional: spread the logs with some egg yolk and roll them though the sugar! Extra sugar cookies! It’s really almost Christmas now! What are you doing this year with Christmas? A 15 courses menu? (it wouldn’t be a surprise with you foodies!) Eating out in a Michelin worthy restaurant? Nothing? Or like us, having a buffet with all kinds of little snacks and other tasty things? 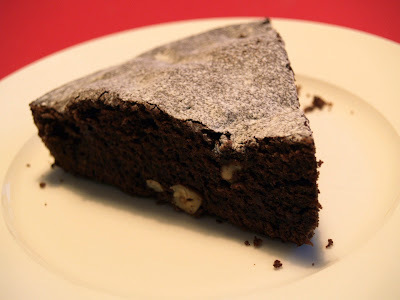 One of them is this rich chocolate cake with hazelnuts. This is the kind of cake that gets only better and better the longer you wait…perfect for Christmas! Last year me and my mom were hostesses, so on Christmas morning after breakfast and presents, we got back in the kitchen and prepared the final things for dinner. It was nice, but busy and slightly chaotic, and their was still a lot to do. I was just making a piecrust: butter, flour and sugar were in the bowl, the hand blender was cheery grunting, and the dough was ready to be made into a bal. I putted down the blender and placed my hands in the bowl. I wanted to have as well the last bit of dough that was sticking in the blender, so I, clearly without thinking, went for it. Have a great time, merry Christmas everybody! 1. Preheat over to 180°C (350°F) and grease and flour a 22cm (9 inch) round cake pan. 2. In a small saucepan, mix the chocolate, broken in little pieces, and the butter over low heat till the chocolate is melted. Take the pan of the fire and let to cool a bit. 3. In a medium bowl, whisk the egg yolks and the sugar together to a thick, creamy mixture. Mix in the chocolate mixture, rum, maizena and hazelnuts until well blended. 4. Whisk the egg whites until stiff (but not dry!) and fold them carefully in the chocolate/hazelnuts mixture. Scoop this mixture into the prepared cake pan and bake for 30 till 40 minutes. 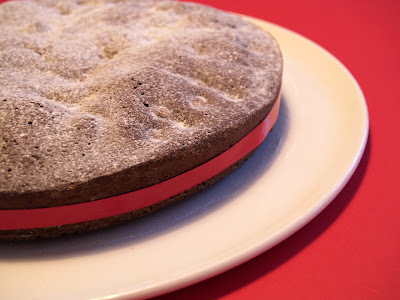 The cake is ready when it’s dry and firm to the touch, but still a bit wet and silky inside. The top is as well cracked, but that’s how it should be. Let the cake in it’s for until it’s completely cooled, take out on a serving plate and dust with powder sugar. 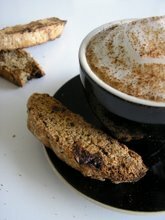 Optional: serve with a big dot of mascarpone and strong coffee…Yum! Sinterklaas has left the country, our (gigantic) tree is up, shining and smelling really nice, and I have finally time to spend some time behind the computer and post again. It has been so busy lately…I’m glad it’s almost vacation - time for Christmas! Did you know that Santa Claus is based on our Sinterklaas? Yes - they both refer to Saint Nicolas; a bishop who lived in the third century and became known for his generosity and love for children. Here in Holland you see around this time of year a sort of battle between Sinterklaas and Santa Claus, on who’s nicer/better…really strange when you know they are the same person! Anyway, Saint Nicolas 1 is gone and it’s time for number 2! Christmas! Time for a lovely, forest-y smelling house, twinkling lights, Christmas songs on the radio, snow (yeah right! ), presents under the tree, and…making Christmas cookies! Making Christmas cookies is such a relaxing, rewarding thing - and it will definitely bring you in the holiday spirit! I made my basic recipe which is perfect and really hard to mess up, and when I was finished I added some of my favourite flavours. They all turned out beautiful and perfectly crispy, but the cinnamon version was absolutely my favourite…delicious! - sprinkles, candy pens, sugar balls, etc. 1. In a large bowl, mix together flour, salt, spices and baking powder. Add the butter and sugar, and mix with the electric mixer fitted with the paddle attachment, until crumbly. While the mixer is spinning, slowly add the egg/honey mixture. - Don’t pour in at once, otherwise there is a big chance you’re dough will be too sticky! - Pour in until you have a well blended, handable dough. The dough is now ready. You can just use it like this (and go to step 2) or add some spices/flavours. Divide the dough into three and put the three balls into different, small bowls. Add to bowl 1 a good pinch of salt and 1 teaspoon of pepper. Knead this into the dough. Do this as well for bowl 2 and 3, adding 1 tablespoon of ground cinnamon, and 2 tablespoon of cacao powder. 2. Beat each ball down to a disc and wrap into plastic. Refrigerate for at least 15 minutes. 3. Preheat oven to 170°C (340°F) and line two baking sheets with parchment paper. Flour your work surface, and take out the first disk of dough. Roll out thinly, keep flouring (it can be a bit sticky) and cut out the cookies - or if you don’t have cookie cutters, just carve them out with a sharp knife. 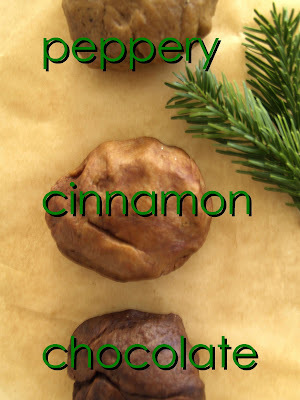 Transfer to the baking sheet and make a small hole in each cookie so you can hang them in the tree. Knead the leftovers together, roll out again and cut out more cookies. Do this until you have no more dough left. Do this as well with the other two flavours. 4. Bake for about 10 minutes until the bottom is golden brown. But keep checking them during the baking! Let cool completely and make the glaze, or store in an airtight container. 1. Mix the confection’s sugar with the boiling water, adding each spoon of water after the previous one is well blended, until you have a silky, thick glaze. Melt the chocolate, while stirring, in an heatproof bowl. I told extensive and detailed about it earlier, but I wanted to tell and show you in brief some other sweet (and very tasty) things we did. Our dinner at Ladurée on the Champs Elyseé for example. I had the Bonaparte Salad - with Scottish smoked salmon, salmon eggs, blini, olive oil, lemon juice, seaweed tartare and black olives cream…- and it was absolutely amazing. Simple perfection. Made with only the best ingredients, this was one of the best things I have ever eaten. 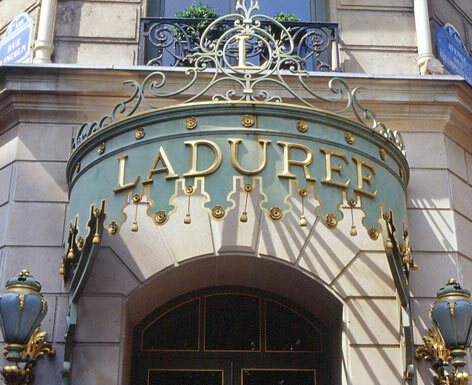 But I said that as well about their Ladurée Salad and Club Champs-Elysées. 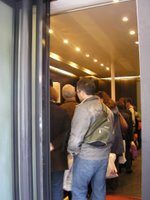 And from seeing the queue of people waiting to be seated and their plates and expressions, I can conclude everything is amazing here! For dessert we had the Tarte Tatin, the Coupe Fraise-Coquelicot and the Eclatant Fraise Figue. The Tarte Tatin was without a doubt the best out of these three. We consumed more for lunch the next day at BE, Boulange épicier, a fusion of a "boulanger" and an "épicier" - baker and grocer. 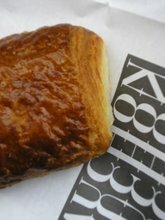 We read that BE had the best sandwiches of Paris, and since the store is owned by no one less than Alain Ducasse and Eric Kayser, this wasn’t so hard to believe. We ordered a lentil salad, 2 pesto/mozzarella/tomato/basil sandwiches -which were served onto indeed one of the best breads I’ve ever tasted: It was soft, slightly sweet and a bit brioche-ish. 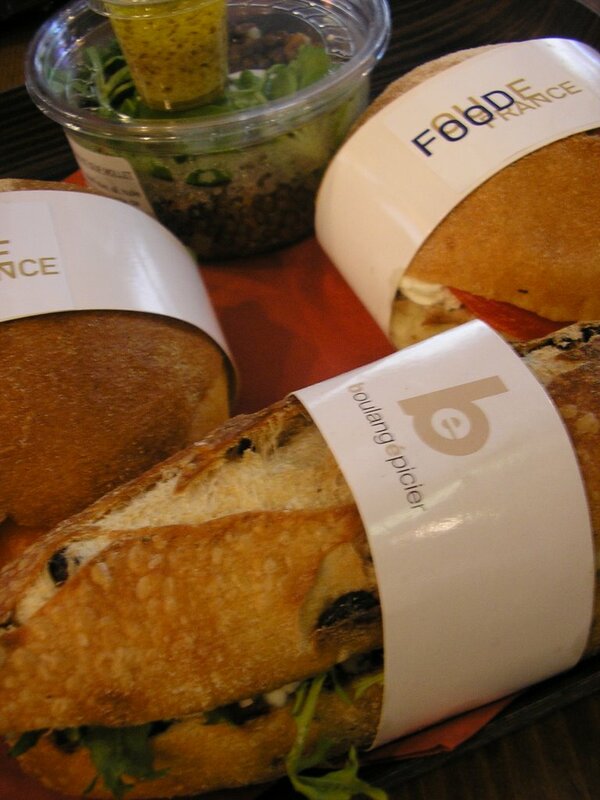 Amazing… - The last sandwich was a larger, sweet raisin pain, with roquefort and pear. Wonderful. I’m glad we went, but it was a bit disappointed since we expected a real restaurant. 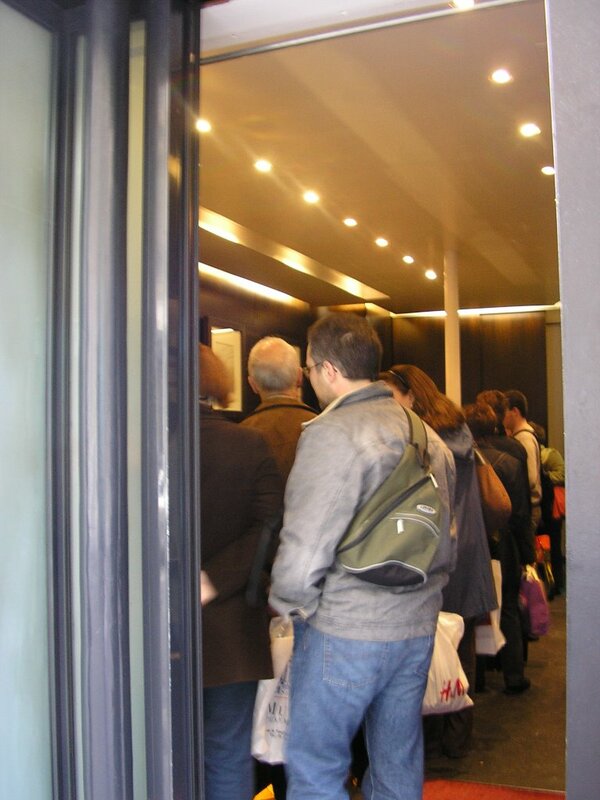 BE is a wonderful store, with wonderful food, but more for take-away. 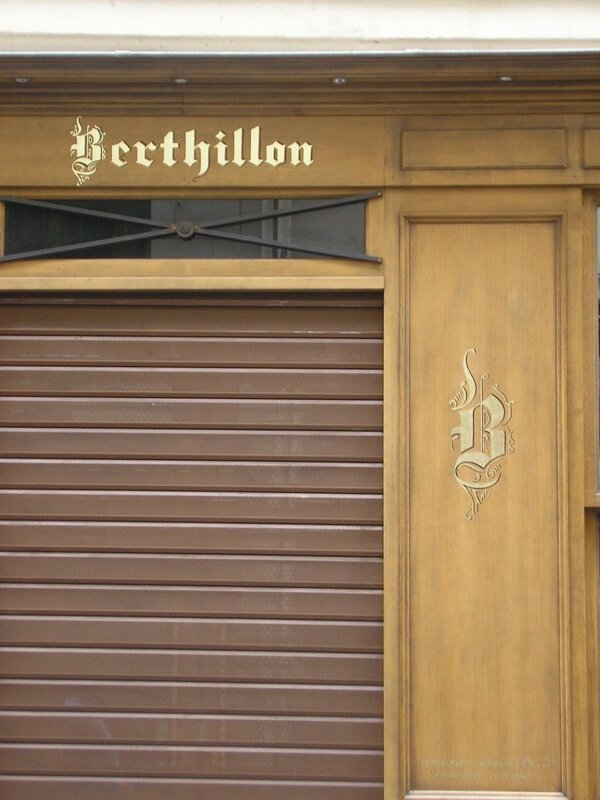 We heard so much about Berthillon and their ice cream in flavours like caramel and chocolat amar, I couldn’t stop thinking about it and just had to go. 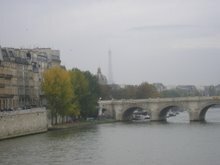 So on Saturday morning, after our morning coffee and croissant, we ‘shopped’ ourselves down to Île Saint-Louis - one of the two little islands in Paris, surrounded by the Seine. 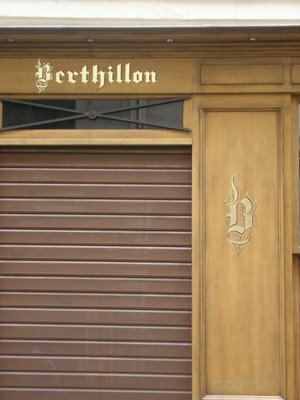 We rushed pass the Notre-Dame, with just one intention: Berthillon. But if we want ice cream, we will get ice cream. Absolutely delicious. I’m not really an ice cream expert, I almost never eat ice cream, (I prefer something with a bite…) but my sister, who happens to be an ice cream expert, approves it as well. Very nice is you can choose as many flavours as you want. 20 flavours in just one scoop? No problem. 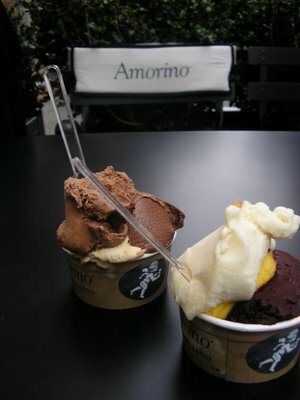 The mango and caffe were my favourites. The last thing I want to share is this pain au chocolat from Fauchon. 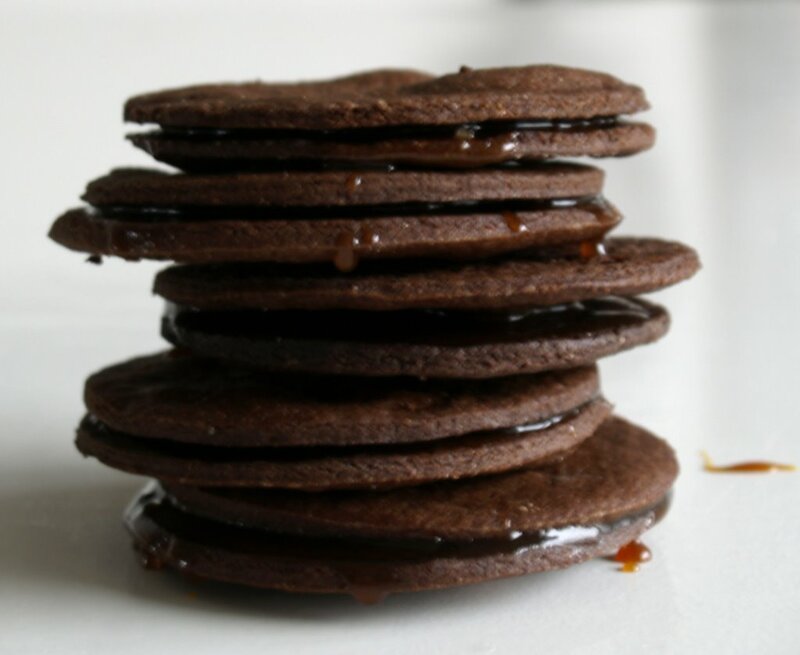 These Chocolade Stroopkoeken (chocolate treacle cookies) are a classic example for this. 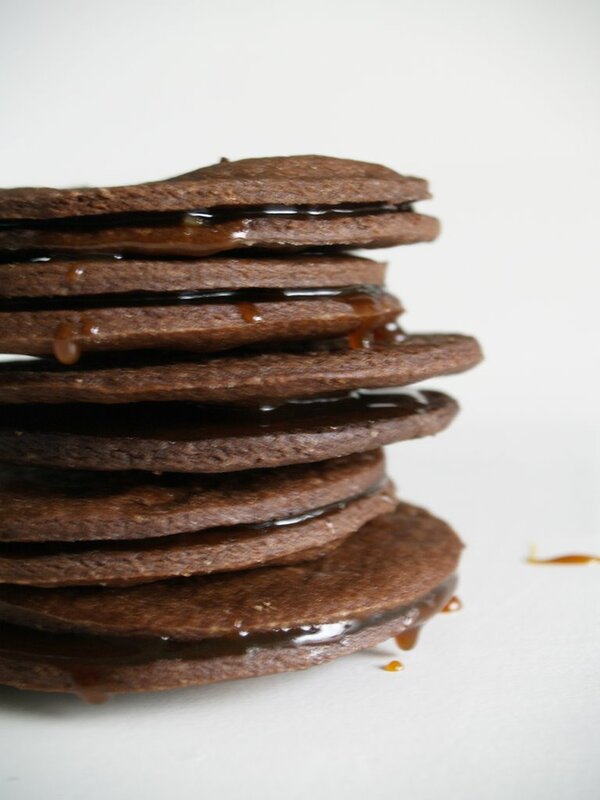 They are not just two crispy chocolaty cookies fused together with some hot, creamy, salted treacle….but they are the best crispy chocolaty cookies fused together with some hot, creamy, salted treacle. They are amazing. Make a hundred and you still want more, I guarantee. The stroopkoek is a typically Dutch product. Only, undeserved, a whole lot less known then it’s brother the stroopwaffle. Although I can appreciate a hot, freshly made stroopwaffle from time to time, (especially with this colder weather) I prefer a stroopkoek. 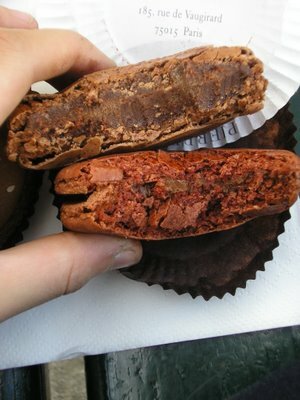 And then of course the version as shown here above: thinner, chocolaty and salted. Heaven. I got them from Koekje, the cookie-bible I wrote about before. The recipe comes from Kees Raat (kind of logical since it’s a(n incredible) twist on the normal stroopkoek…) but I adjusted it slightly since I didn’t have pepper vinegar or zeeuwse flour (from Zeeland - a part of Holland) and because - let’s face it - I like it always just a bit more salty and chocolaty. 1. In a medium bowl, sift together flower, cocoa powder, baking powder, salt and pepper. Set aside. In a large bowl, mix butter, the two sugars, vinegar and egg. Add the flower mixture to the sugar mixture and knead it to a ball. Pack in foil and let rest in the fridge for at least one hour. 2. Preheat oven to 170°C (340°F) and line 2 baking sheets with parchment paper. 3. Get the dough out of the fridge and roll out thinly on a lightly flowered surface. (if it’s too sticky, use some more flower) you can best do this in 3 or 4 times as the dough will break easily. With a round 10cm (4inches) form, - or a cute small one…- stick out cookies and line them on the baking sheets. Bake for about 10 minutes, until set and down. Let cool completely and make the syrup. 1. In a small saucepan over medium heat, melt treacle with sugar, butter and salt. Stir until well blended and let cool a bit. 2. 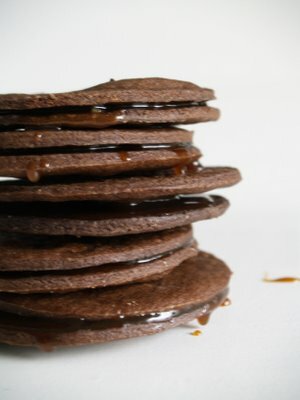 Ladle syrup on the flat side of a cookies, move it a bit back and forth to even and close with a second cookie. Repeat with remaining cookies. Enjoy immediately or keep in an airtight container for up to 3 days. In Holland there are just a few really good, legendary, patissiers. Two of them are Cees Holtkamp and Kees Raat. Cees Holtkamp started in Amsterdam in 1969 and is famous for his simple, straightforward and traditional approach to baking. 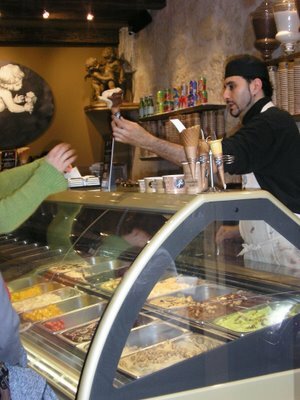 Kees Raat opened his ‘Unlimited Delicious’ in Amsterdam 15 years ago and became known for his originality and uniqueness. I can’t believe Koekje wasn’t here earlier - it’s indispensable. Koekje is a clear-cut, beautiful book with on every single page a picture. I love that I now finally have a book where all the recipes for good Dutch cookies are bound together. 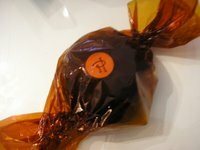 Who still knows how a Haarlems Halletje or Nonnenscheetje taste? Haagsche Wind (Wind of the Hague) dates all the way back to 1880. 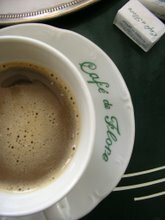 Living in The Hague and never having tried it - how could I not make it? 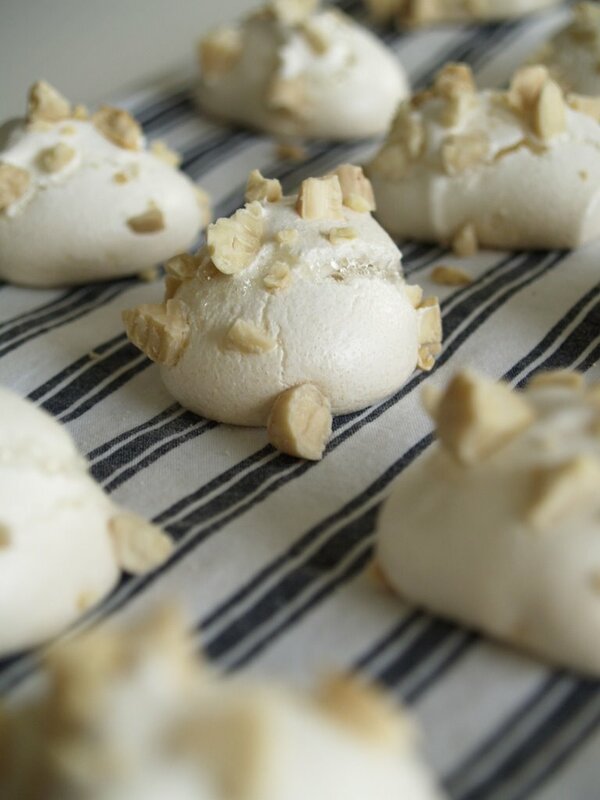 Haagsche Wind is a sweet little meringue cookie with cute looking almonds on top. It’s one lovely cloudy bite: crunchy on the outside and soft and airy inside. Meringues are well loved in my family. 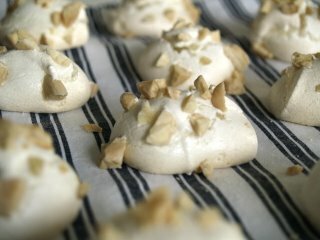 I once tried to make meringues, but it didn’t work out so well - this recipe however, is a keeper. 99 recipes left in ‘Koekje’…what will I make next? 1. Preheat oven to 120° C (248° F) and line one baking sheet with parchment paper. 2. Beat, with an electric mixer, egg whites until frothy. Gradually add granulated sugar and mix until well blended. Beat in the confectioner’s sugar carefully until the mixture is white and glossy. 3. Fill pastry bag (with a 2cm, 1 inch tip) with the mixture and drop little dots on the prepared baking sheet. Sprinkle with the roasted almonds and bake for 20 minutes until set. Let cool completely before enjoying and store in an airtight container. My new camera is driving me nuts. It’s so pretty and I really love it but I’m beginning to get a little desperate. all the cashew-caramel cookies disappeared quickly. And this was the best picture in the bunch. Because they weren’t just good. Well, these nut cookies are like the best cookie dough ever. I found the recipe online at MarthaStewart.com but I made some big changes in the process so I typed out what I’ve done here below. I don’t have a decent electric mixer to grind cashews with, only a puree mixer with a sharp blade which will make the nuts fly and spring everywhere (I have btw a rather horrific Christmas story about this blade - but that maybe for later…) so I just chopped 1 cup finely and kept the rest in big chunks. This worked out really well as I may say so. I kept the pear in the recipe what so ever - who knows how they would turn out without it?? Mix in egg, vanilla and oil. Reduce speed to low and gradually add flour mixture. 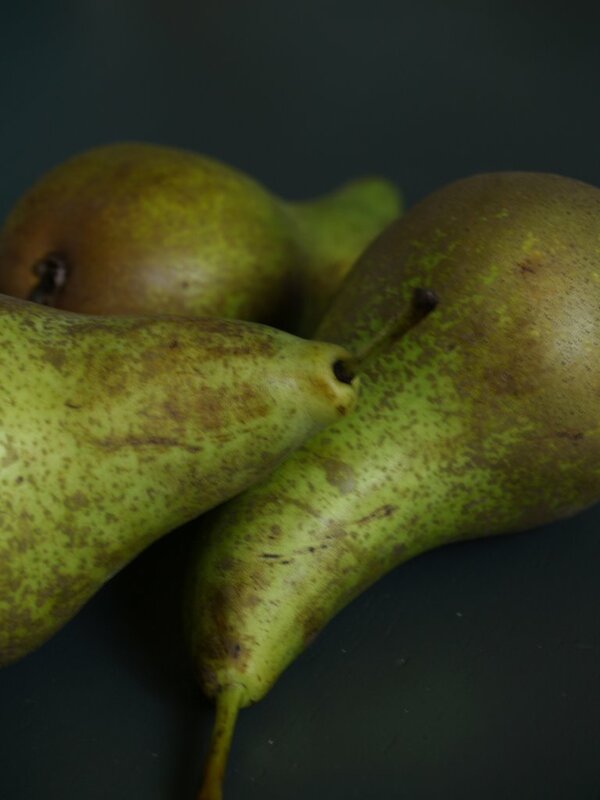 Wash and dry the pear and thinly slice it with a cheese-slicer. Chop these slices into even smaller bits and mix it in with the reserved, roughly chopped cashews. 2. Shape dough into 4cm (1 1/2-inch) balls; space 5cm (2 inches) apart on 2 parchment-lined baking sheets. Bake 6 minutes and gently flatten with a spatula. Bake until bottoms are just golden, 6 to 7 minutes more. Let cool completely. 3. For the caramel, melt caramels with cream in a small saucepan over low heat, stirring. Let cool. 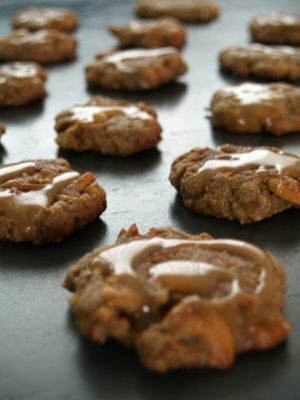 Using a spoon, drizzle caramel over cookies and let set. Store the cookies in an airtight box in single layers. I’d forgotten the power of a good basic cake. Pound cake is the best. Or more precisely; Madeira cake is the best. And this version is even better; it’s so easy, has a lovely lemony twist and a divine sugar topping that really gives the extra touch. The recipe comes from Nigella Lawson’s How To Be A Domestic Goddess, i.e. my first cookbook. My collection has, as you might have noticed, grown considerably since then but it still has a special spot with me. I made this cake from it quite some time ago on request. I was actually already forgotten it but (luckily) came across the pictures when I sorted out my files. This is a wonderful cake, even the best in its sort I think. 1. 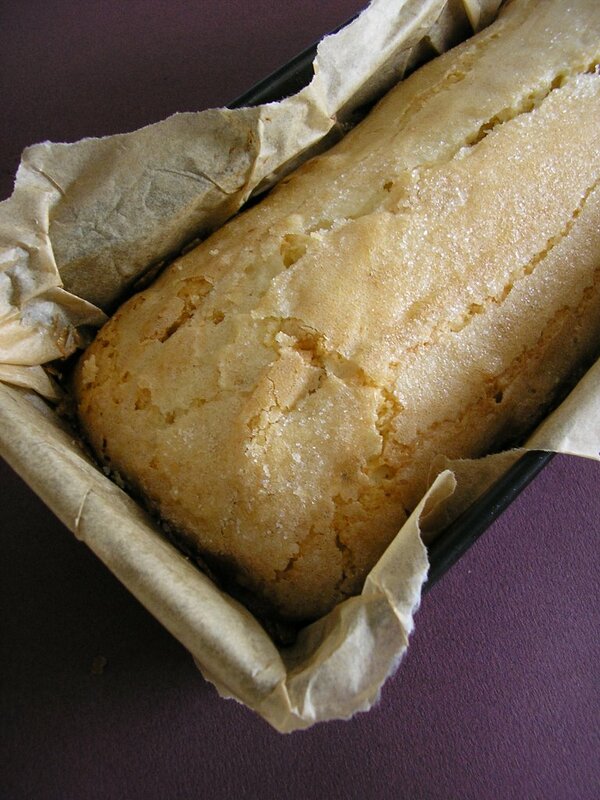 Preheat oven to 170°C (330°F) and butter and line a cake form with parchment paper. 2. Stir butter and sugar until creamy and add lemon zest. Mix in one egg, then one tablespoon of flour, then an egg again…and so on. Add the rest of the flour, mix well, and add the lemon juice. stir until well combined. 3. Pour the batter in the prepared form and sprinkle generously with sugar (about 2 Tbsp) Bake for 1 hour, until a toothpick inserted into the centre comes out clean. Cool completely, then invert onto a serving plate. 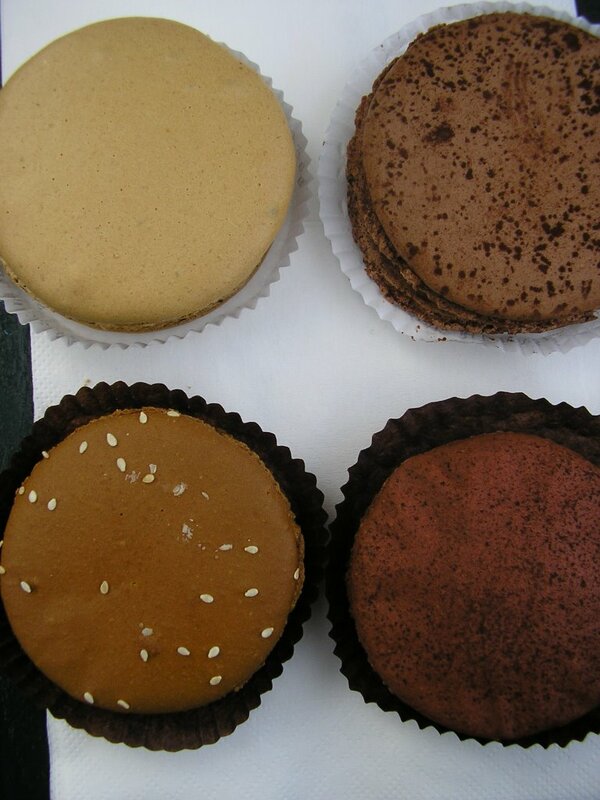 If I were a cookie, I would be a macaron. No question. it’s just the best cookie. The taste of the crunchy and slightly chewy outside, and soft and smooth inside…:it’s heaven between 2 little shells. 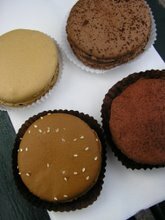 Making good macarons - not to be confused with the coconut macaroon - is however difficult and a real art. You can find in almost every sweet cookbook a macaron recipe and on Google more than 28.000 hits will appear on your screen from recipe sites and fellow bloggers, but the recipe for the perfect macaron is, and will probably always be, a question for us humble human beings. That’s another reason why I’m so delighted about Paris. Everywhere you look are little (and large famous ones…!) 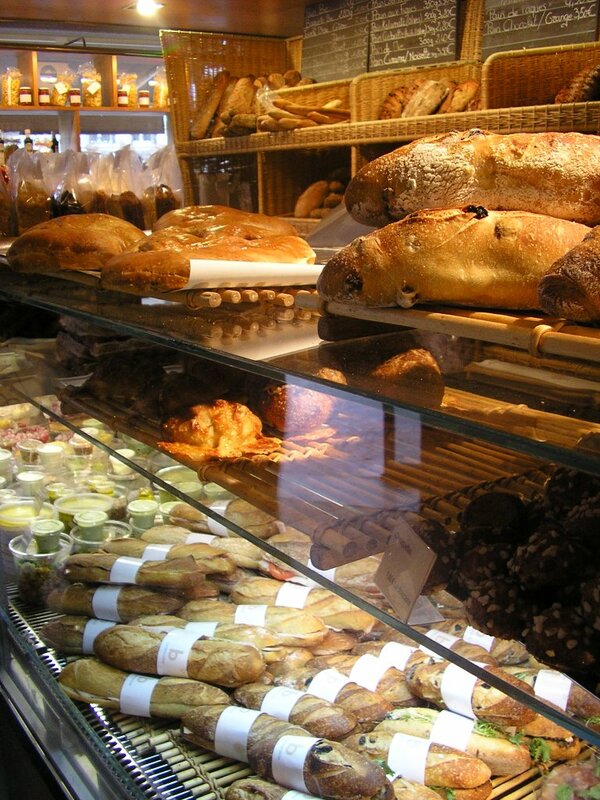 bakery’s, patisseries and chocolatiers with the most beautiful display windows, loaded with freshly baked goods. 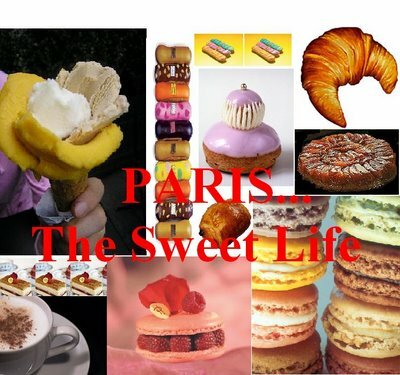 You name it; croissants, pain au chocolat, millefeuilles, éclairs, madeleines and of course…macarons (!) In every thinkable colour and flavour, beautifully lined up, waiting to be bought. What do you think about marron et thé vert matcha or perhaps a huile d'olive et vanille macaron? 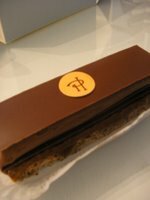 I wish I could have sampled from every shop I came across, including Maison du Chocolat and Laduree but it was just too much. Very unexpected and kind of new for me, but there was just too much good food. 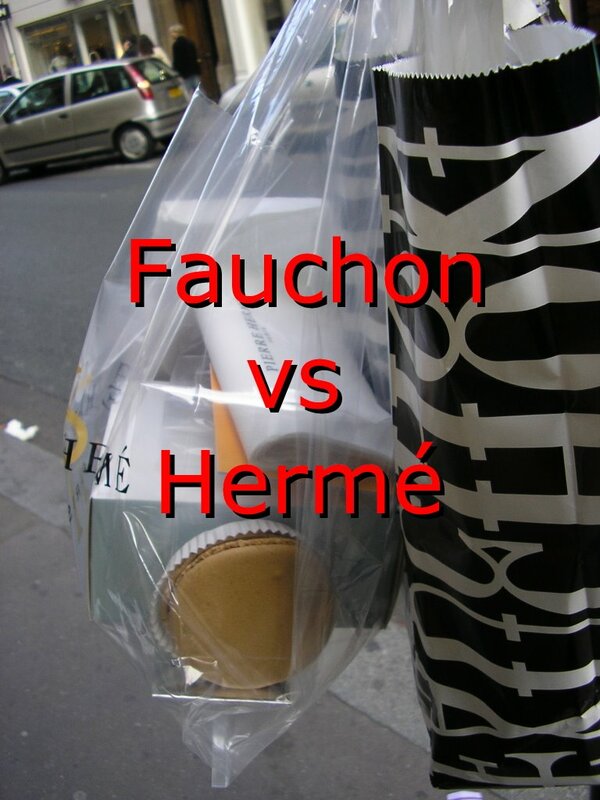 So I stayed with Fauchon and Hermé. I lost my heart to Fauchon when I was ten. It was my first time in Paris and I sat in the beautifully decorated tearoom behind my chocolate tasting plate, all feeling special. Such an experience for a little girl. Fauchon’s macarons are fine. Great even if you haven’t tasted the perfect one. They have a very soft (in my opinion too soft…) centre but a good, strong chocolate/coffee flavour. They are chewy, have in proportions very thick shells and little filling and chewing is not really required with these macarons. I was speechless - how does he come up with it?? It was just perfect. Heaven. Al the flavours 'fit' with each other. And so is his entire shop - everything looks incredible and is made with such care, love and preciseness.